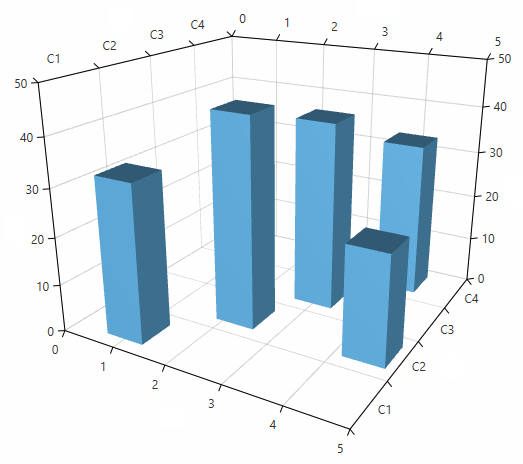 This article explains how to bind a 3D chart series to a collection of business objects. To data bound the series you can use its ItemsSource property. The property is of type IEnumerable so you can use most collection types. The chart creates a DataPoint3D model for each business object in the ItemsSource collection. To map the properties of the business object to the DataPoint3D you can use the series value binding properties. XValueBinding: The binding that will be used to fill the data point model XValue property. YValueBinding: The binding that will be used to fill the data point model YValue property. ZValueBinding: The binding that will be used to fill the data point model ZValue property. The properties are of type DataPointBinding which is an abstract class that has two implementations - PropertyNameDataPointBinding and GenericDataPointBinding. The PropertyNameDataPointBinding expect a path (name) to a property in the business object of the data point. The binding class obtains the property using reflection, gets the corresponding value and assigns it to the data point model. This type of binding is used when you set the value binding properties in XAML. The GenericDataPointBinding<TElement, TResult> expects a function that selects a value from the business object. Then it sets this value to the corresponding property of the data point model. This type of binding can be used only in code. In summary, to bind data to a 3D chart series, you will need to set 4 properties - YValueBinding, XValueBinding, ZValueBinding and ItemsSource. This section contains a complete data binding example.